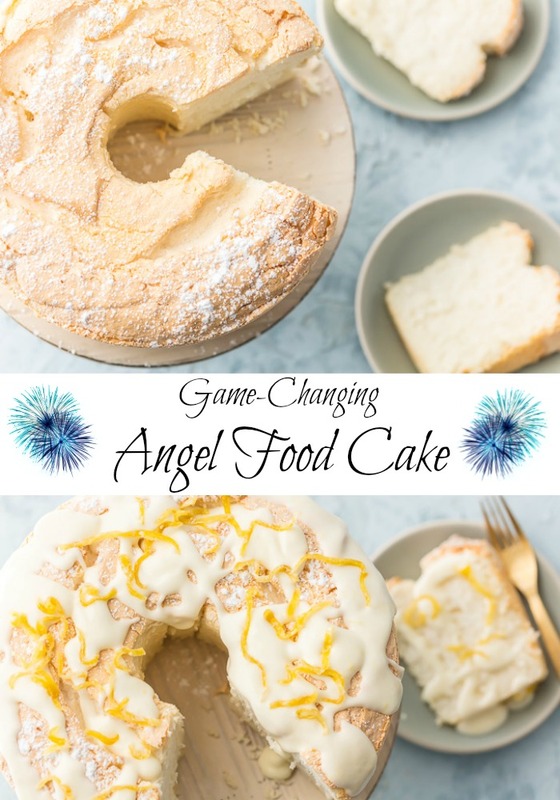 I didn’t call Game-Changing Angel Food Cake “game-changing” to get your attention. 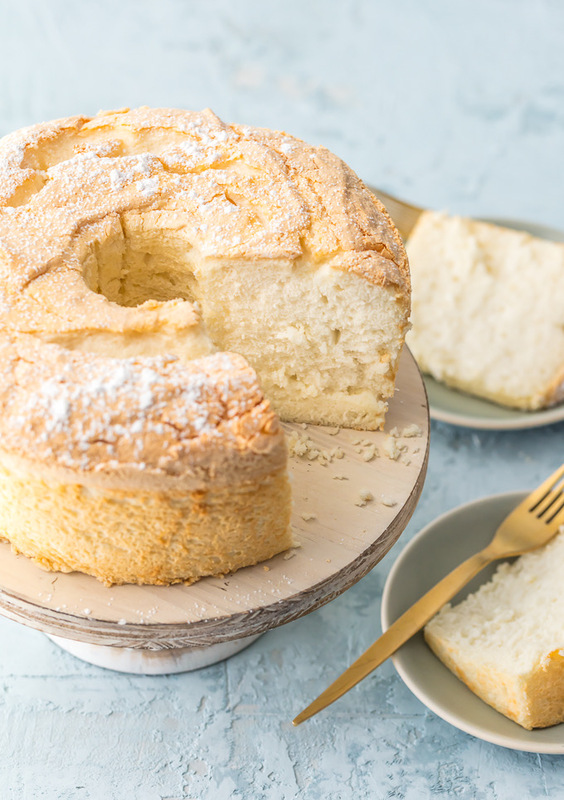 I called this angel food cake “game-changing” because it took all I knew about making angel food cake and flipped it around. 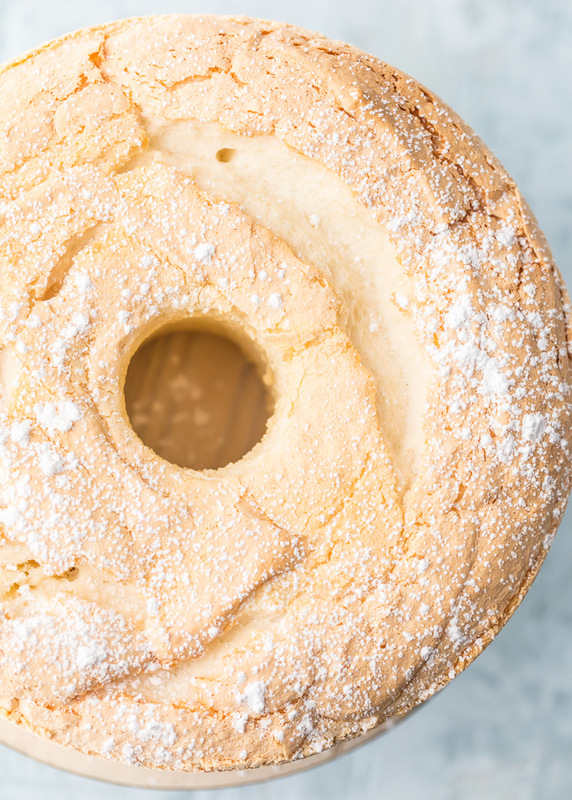 This recipe gave me the advantage in the Susie Gall vs. Angel Food Cake wars, and now I win each time I make Game-Changing Angel Food Cake. I should know; I’ve made it three times in three weeks without one glitch. I don’t need to use room temperature eggs. I don’t need to use the freshest eggs. I don’t need to use a stabilizer such as cornstarch. I don’t need to worry if I get a teeny bit of yolk in the whites. I don’t need to add the sugar one tablespoon at a time. I don’t need to sift the flour 3-4 times. I don’t need to add the flour one tablespoon at a time. I don’t need to start with a cold oven. I don’t need to keep my fingers crossed, pray and tiptoe around the house while it is baking. I don’t need to worry about that nonsense anymore. I do need to preheat my oven and set the rack to the middle position. I do need to use a 10-inch ungreased, nonstick aluminum tube pan with a removable bottom. I do need to use bleached cake flour. I do need to set my mixer to the correct speeds and follow the recipe. I do need to turn the cake upside down to cool. I do need to let it cool completely before touching it again. I do need to loosen the cake before removing it from the pan. I do need to eat it without sharing. I served Game-Changing Angel Food Cake at a dinner party last week. After my guests took their first bites, not one word was spoken for several seconds. Not one word was spoken, but I did hear lots of muffled “Mmms” and licking of forks. I know a great cake when I hear one, and this is a great cake. I don’t think Billie (yes, that is what his mother called him) wasn’t thinking about Game-Changing Angel Food Cake when he wrote Romeo and Juliet, but if he had been, he might have called it Fairy Pie. 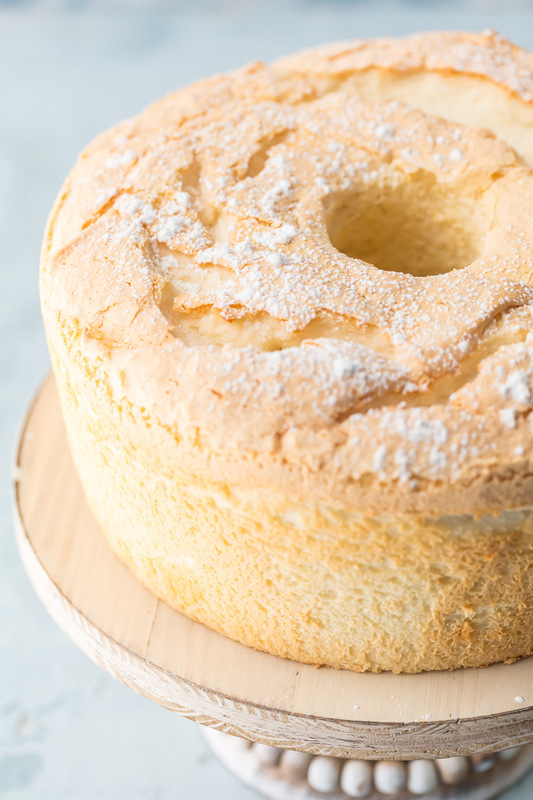 Game-Changing Angel Food Cake has a velvety, melt-in-your-mouth, pillowy texture and a toasty top with a slight crunch. 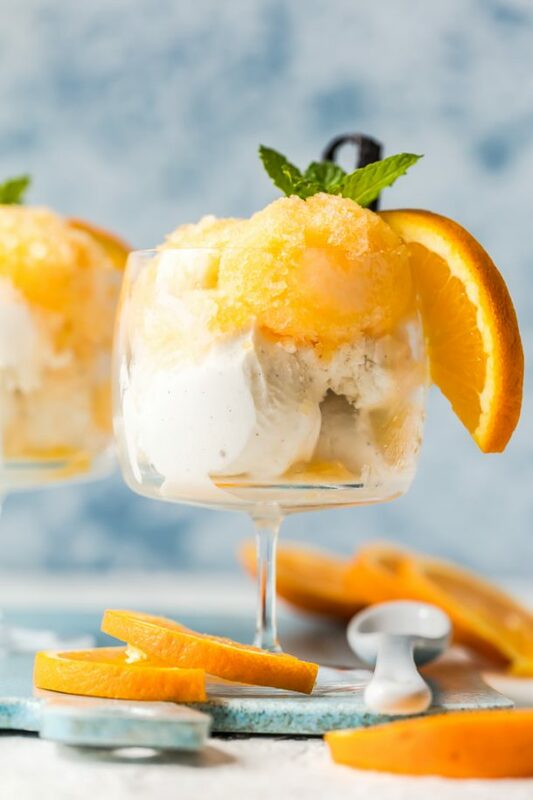 It is just as delicious served with or without a frosting or other topping, but…I added Lemon Cream Glaze and Candied Lemon Zest for a decadently, sinful and luxurious version. 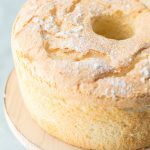 I say this with utmost humility and sincerity, Game-Changing Angel Food Cake is the only angel food cake recipe you will ever need and it is the best tasting and easiest angel food cake in the world! “What do you do with the yolks?” asked David (yes, the friend mentioned above). I responded, “I cook them and feed them to Harper (our dog)”. I received a curious look in return and thought that, surely, I should come up with a better answer than that. Well, I’m glad to report I have and that deliciousness is coming soon…a Twelve Yolk Pound Cake. I need to think up another great treat for Harper, poor girl. So thanks, David. Without your inquiry I would never have discovered another great recipe. I didn’t create this cake. Stella Parks at Serious Eats shared it first and I’m so glad she did. Thank you, Stella! 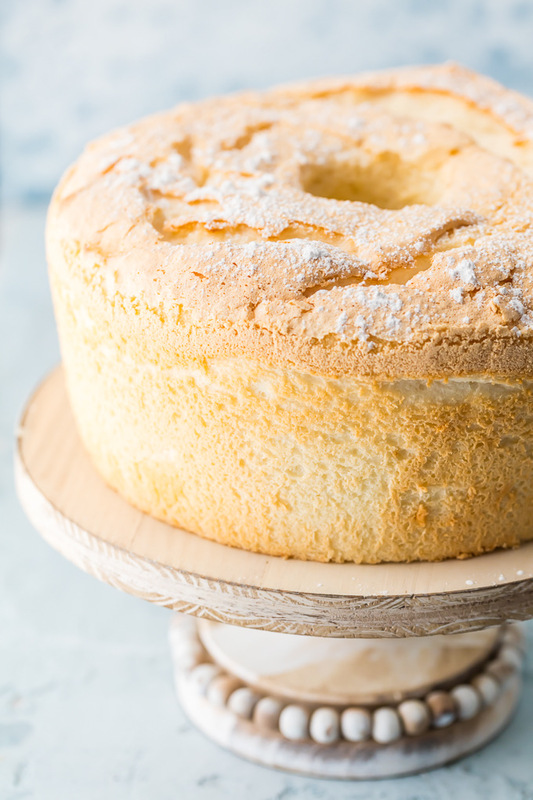 Game-Changing Angel Food Cake is truly game-changing. It is no-fuss and has a velvety, melt-in-your-mouth texture with a slightly crunchy top. It is just as delicious served with or without any toppings. 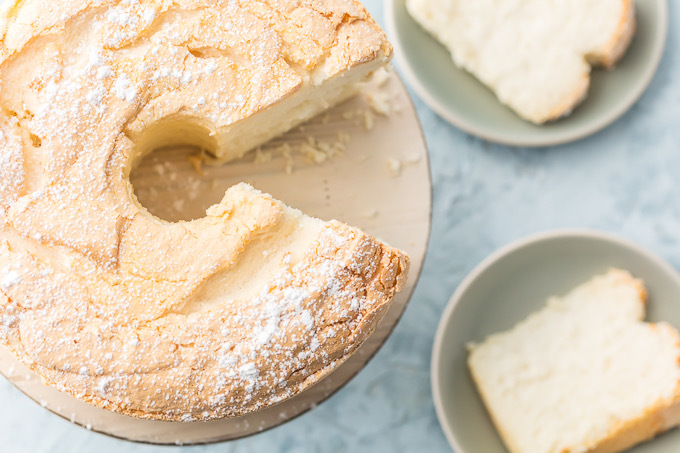 This cake is the only Angel Food Cake one will ever need and is the best Angel Food Cake recipe - ever!Read the notes for a few tips before baking this cake. 5 ounces 1 cup + 2 tablespoons or 140g BLEACHED cake flour (Swan’s Down or Softasilk) *See note. 15 ounces granulated sugar 2 cups or 425g **See note. 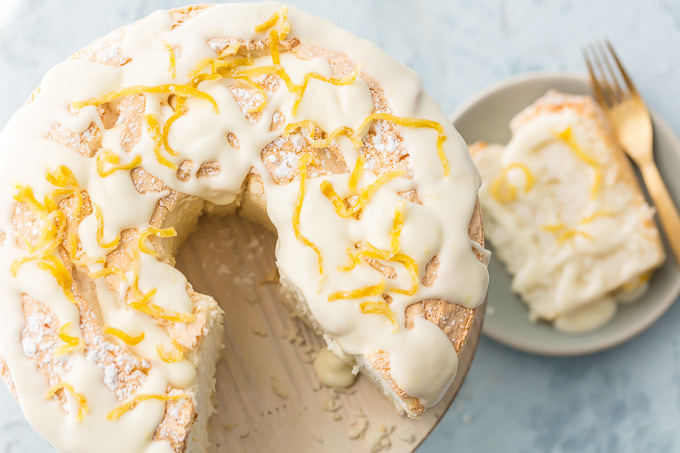 The Lemon Cream Glaze can be made while the cake bakes or made up to 5 days ahead. The Candied Lemon Zest needs to be made 4 hours or up to 5 days ahead. Place oven rack in the middle position, and heat oven to 350°F. Set a 10-inch aluminum tube (angel food cake) pan nearby. Do NOT grease or butter the pan. Shake flour through a mesh strainer or sift it and set aside. In the bowl of a stand mixer fitted with the whisk attachment, combine egg whites, sugar and vanilla extract. Mix on LOW 1 minute, then increase speed to MEDIUM-LOW and whip 3 minutes. The whites will look darker and will still be thick. With the mixer running, add lemon juice and salt. Set speed to MEDIUM and whisk the meringue 3 more minutes. At this stage, the meringue will be foamy and thin. Increase speed to MEDIUM-HIGH and whip another 2-4 minutes. The meringue should be glossy white and thick(ish), but not to the stiff-peak stage. It should still be soft enough to run off the wires of the whisk, when lifted, and mound like soft-serve ice cream in the bowl. Sprinkle cake flour over the meringue and use a clean & dry rubber spatula to fold the flour into the meringue. Fold the flour by scraping from the bottom up and folding through the center. Fold the flour until no pockets of flour remain. Spoon the batter into the (ungreased) tube pan and gently smooth it out on top. Give the pan a couple of gentle raps on the counter to release any large air bubbles. Bake at 350°F 40-50 minutes or until the cake has risen, is golden blond and somewhat firm to the touch. The internal temperature should read 206°F on a food thermometer. Angel Food Cake has to be placed upside down to cool completely. If your pan has stilts, invert it onto its stilts over a clean kitchen towel. If your pan doesn’t have stilts, invert it onto a trio of cans (see ***Note). Allow cake to cool completely – at least 2 hours. Slide a thin knife or an offset spatula around the sides and around the center tube to loosen the cake. Lift the cake by the center tube and set it on the counter. Loosen the bottom of the cake by sliding a knife between the cake and the bottom of the pan’s insert. Place one hand on each side of the cake and carefully lift the cake off the center tube. Set the cake on a cake tray or serving plate. Use a stand or hand mixer to beat the cream cheese and butter, at medium speed, until creamy and light. Add lemon juice and lemon zest and beat until well incorporated. Gradually add powdered sugar, on low speed, until glaze is smooth and creamy. Glaze can be made up to 5 days ahead – be sure to keep refrigerated in an airtight container. 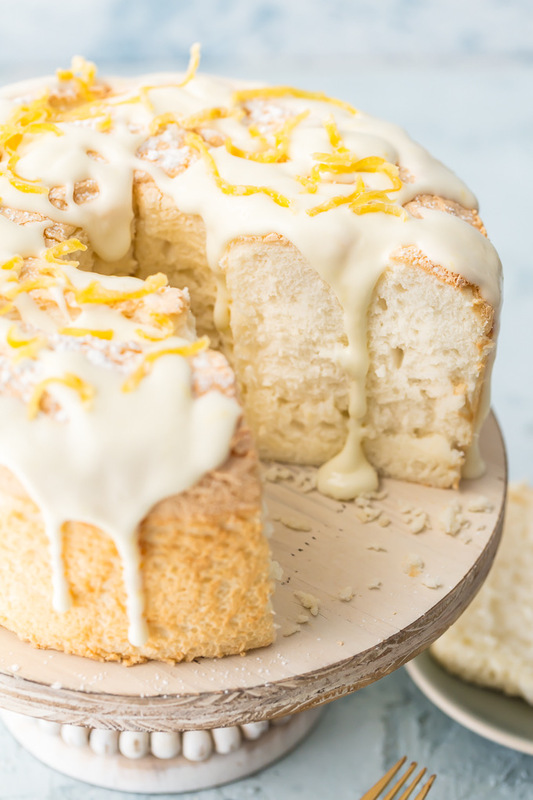 This recipe makes more than needed for this Angel Food Cake; reserve the remainder for another use. It can also be frozen up to 1 month (thaw in the fridge when ready to use). Use a vegetable peeler to peel the zest off the lemons. Be careful to get only the zest and not the white pith. Slice the peels into thin slices and cut the longer slices in half or thirds. Place the peels in a small saucepan and cover with water. Bring the water to a boil and boil for 30 seconds, drain and rinse with cold water. Repeat two more times (a total of three times). After the third time, leave the lemon peel in the strainer until ready to use. In the same saucepan, combine 1 cup water and 1 cup sugar. Heat over medium heat and stir until sugar is melted. Add the peels and bring mixture to a boil. Reduce the heat to low and cook 30-60 minutes. ****See note. Stir occasionally. After the mixture has cooked 30 minutes, watch it closely. The peel should still be a soft yellow and not brownish. It can go from yellow to brown very quickly near the end. The lemon peel is ready when the mixture is very bubbly and almost all the liquid has evaporated. Drain off the lemon syrup. Allow the peels to cool 10 minutes then toss with the reserved 2 tablespoons sugar. Lay the Candied Lemon Zest out to dry completely. 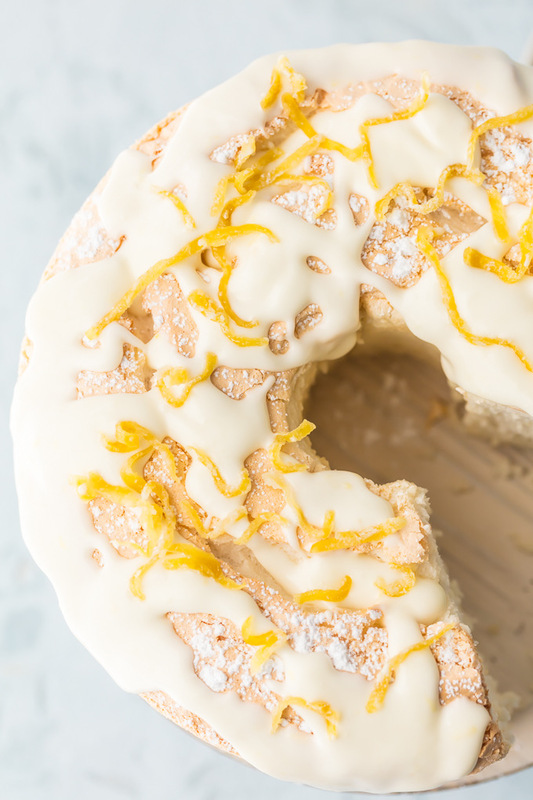 Drizzle with Lemon Cream Glaze and sprinkle with Candied Lemon Zest. Cut cake with a serrated knife. Use a standard 10-inch, non-greased, aluminum tube pan. Preferable one with a removable bottom and prongs around the rim. If you don’t own a kitchen scale, now is a great time to purchase one. It isn’t absolutely necessary to weigh ingredients when baking but it makes baking so much easier. **If you don’t have extra-fine sugar, Process sugar in a food processor until it is fine and still granulated – about 1 minute. Be careful not to pulse it too long or it will turn to powdered sugar. ***Set out three cans of the same height to invert the tube pan on. The inverted pan should rest on the edges of the cans. ****The candied zest in my testing can be ready anywhere between 30-60 minutes. It isn't necessary to watch it constantly for the first 30 minutes, but check and stir it often after that. 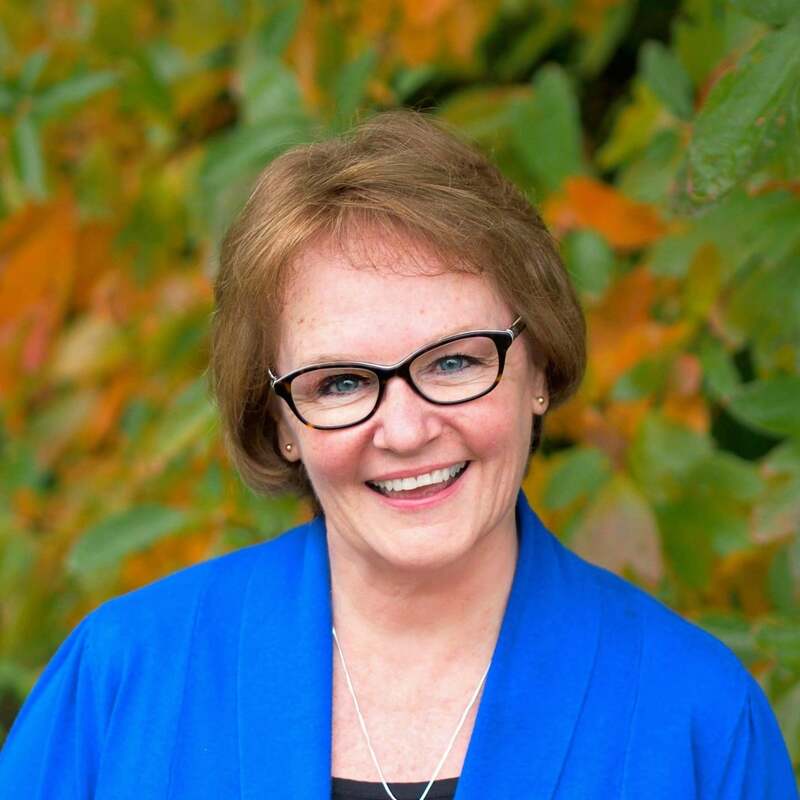 Hey Lori, It is great to hear from you. I have thought about your family and you so often over the years and have gotten updates now and then. I hope you and your family are well. Isn't it impossible our children are grown and Bec & Micah are near the same ages you and I were when we first met? Crazy. Please say hello to Clay and Garret (I'm sure he wouldn't remember me.) I think I heard you are grandparents?? It is the BEST!! Blessings to you, too, sweet friend and thanks for checking out Bec's and my blog. I add 1-2 recipes on Simply Sated per month, and Bec and I add recipes every day to The Cookie Rookie. We are going to start a children's section on The Cookie Rookie, so that should be pretty fun (and keep me very busy). Take care and God Bless! !